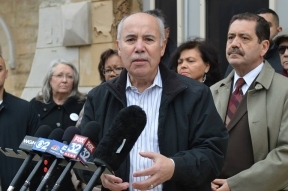 In front of a crowd of supporters, beloved former IL State Senator and Chicago Clerk Miguel del Valle endorsed Jesus “Chuy” Garcia for mayor of Chicago on Sunday, Dec. 14th during a press conference on the steps of Von Humboldt Elementary School. “Chuy is the right candidate for the right time,” said del Valle, who went further to discuss Garcia’s profound understanding of Chicago neighborhood’s. Del Valle praised Chuy’s ability to “to connect the dots on issues of critical concern to Chicago’s grassroots residents and Chuy’s ability to bring progressive policies to City Hall.” Amid a crowd of cheers, Garcia thanked his supporters and discussed his stance on various issues, including education. “We need to change direction at CPS so that our neighborhood schools get the resources they need to thrive, with a focus on expanding equity. Our schools do not flourish when their doors are closed, their budgets slashed, their children tested to death, their dedicated staff fired en masse.” The press conference was held on the steps of Von Humboldt Elementary School, one of the 50 neighborhood schools closed last year. To learn more about Chuy’s campaign, visit www.garciaforchicago.com.